Make your bathroom floor unique with chalk paint! Want to give your bathroom a revamp? Makeover, renovation, revamp – they all usually require big budgets especially when you want a totally different new look. You can do that by repainting your bathroom walls or even just changing your floor tiles to give it a totally new look! 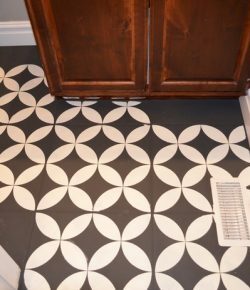 Now if you are on a tight budget, or you just don’t want to go through all the arduous work, here’s one clever idea with floor tiles that gives a great impact for way less! If we can paint walls and furniture, we can definitely cover our tiles with chalk paint too! And you can design it with any stencil pattern that you desire! You can search for beautiful stencils from your local store. But if you fail to find one that fits the size of your tiles (the design should be exactly the same size as the tiles), there are companies that accept custom stencil orders online! And the first and probably the most important thing you need to do is to clean the entire surface thoroughly. Because if you paint with some dirt still left on your floor, you’ll end up with spots and lines where the paint did not stick. And this will be very obvious if you are using a dark coloured paint! So vacuum it, mop it and just make sure there are no debris, dust or hair strands on your floor. For more guidelines and tips, you can head over to the tutorial by Mysha linked below! We also prepared an album of this project so you can easily view it for your inspiration. It includes some images from Susanna’s project (Livin’ the Life of Riley) which was inspired by the original blog post as well! Previous PostInstall your own cordwood floor! Next PostCoffee table and Lego storage in one!